Summertime is time to think about preventing dehydration and heat-related illness. Did you know that about 318 Americans die every year of heat-related illnesses, according to the Centers for Disease Control? The sad fact is that most of these deaths could have been prevented, had the victims understood the realities of dehydration and heat-related illness more clearly. Children. When summer vacation from school arrives, most children spend a great deal of time outdoors being active. Because children have a larger surface area in relation to body mass, they often gain heat faster than adults when the outside air temperature is higher than body temperature. Athletes and exercisers. People who spend hours training and competing in the hot summer sun often do not have an adequate intake of fluids to make up for the loss of fluids caused by their activities. Outdoor workers. Workers such as landscapers, construction crews, police officers, postal employees and others who spend most of their days in the heat often have little time for bathroom breaks or for drinking fluids. As a result, these workers may not consume enough fluids during their workdays. Elderly people. There is a fine line between how heat affects most adults and how it affects the elderly in more profound ways. It's extremely important for senior citizens to practice a gradual acclimatization to heat that puts an emphasis on hydration. Is Your Body Acclimated to Heat? You might be thinking: "But I'm used to the heat. It doesn't affect me." That statement may seem like common sense, but nothing could be further from the truth when it comes to heat-related illness and dehydration. According to Dr. Noel D. Nequin, president of the American Medical Athletic Association, "Being 'used to' the heat or 'acclimatized' is necessary for the body to perform in hot, humid conditions without overheating. But acclimatization increases your need for fluid to match the increase in sweat rate, which puts you at higher risk for dehydration and heat illness." So how does one acclimatize their body to heat? It takes about 10 to 14 days of working or exercising in the heat for your body to adjust or become acclimatized. You should cut down on the intensity of your exercise or activity during these first days. 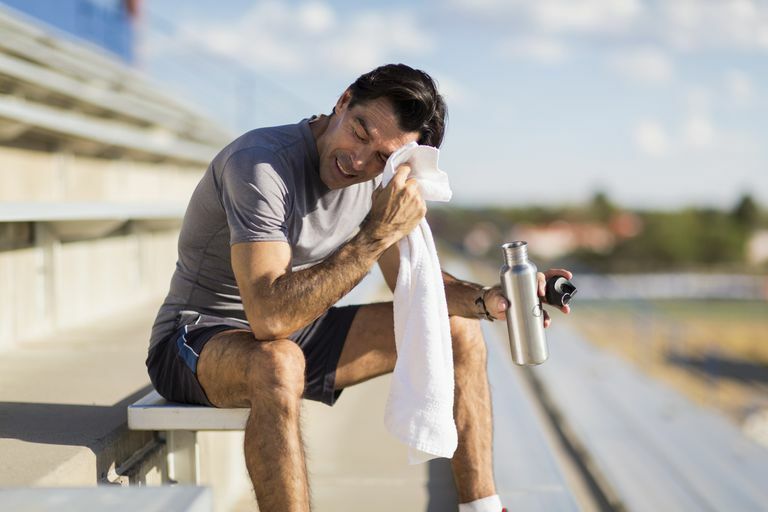 Once your body is heat acclimatized, the amount of sweat you produce and other total body fluid losses increases because you sweat sooner and more than before you became acclimatized. The good news about summer heat is that staying healthy is as easy as becoming educated about your body's need for fluids, and the signs and symptoms of dehydration that can lead to heat-related illnesses such as heat stroke and heat exhaustion. The best time to consume fluids is before you are thirsty. By the time you are thirsty, your body is already dehydrated. It's best to drink on a schedule when it is hot outside. Avoid drinks that contain caffeine or alcohol while in the sun or heat. These types of drinks stimulate the production of urine, thereby promoting dehydration. The best drink is water. You could also opt for one of the many flavored sports drinks that are on the market. According to Dr. Nequin, "Research clearly shows that a properly formulated sports drink like Gatorade combines flavor and sodium to encourage people to drink more than they would when they only have access to water. Sports drinks help to replace some of the electrolytes you lose through sweat and provide carbohydrate energy to working muscles." Water is a necessity that the human body requires to stay healthy. If you fail to drink enough daily water or other non-caffeinated fluids, you may experience a heat-related illness such as dehydration. But how much water is necessary in order to stay hydrated and prevent dehydration or other heat-related illnesses? Adults need 17 to 20 ounces of fluid before beginning activity as well as an additional 7 to 10 ounces every 10 to 20 minutes during activity. Your fluid needs don't stop when your activity is over: you should consume 24 ounces of fluid within the first 2 hours after outdoor activity. Children need 4 to 8 ounces of fluid before beginning outdoor activities, and 5 to 9 ounces every 20 minutes while they are outside. Once kids return from outside play or activity, they also need to consume 24 ounces of fluids within the first 2 hours after they stopped their activities. Did you know? One adult-sized gulp of fluid equals one ounce of fluid, and one child-size gulp of fluid equals one-half ounce of fluid. Drinking water is the best thing you can do to stay hydrated, but there are a few other things you can do to prevent dehydration. Wear light-colored and loose-fitting clothing to stay cool. Whenever you get a chance, take a break in the shade. It's important to remember that anytime a person who has been exposed to heat becomes disoriented or unconscious, immediate medical attention for that person must be sought. You may be familiar with a few concepts that are actually incorrectly believed to keep you cool. Take pouring water over your head, for example. It might feel good, but it actually has no effect on your core body temperature. Kari Volyn, Kari. Beat the Heat: AMAA Warns About Dangers of Heat Illness. The American Medical Athletic Association. 15 June 2002.